Story Fischer is celebrating in her small Wisconsin town: her divorce is final, her market is busy, and the honey that she harvested as a new beekeeper is starting to show up on her shelves. But when her mentor is found dead from bee stings in the middle of his apiary, her sweet outlook quickly sours. Not only does Story have to convince the locals that the honeybees are not responsible, but then she must quickly convince them that she is not responsible for the next dead body that shows up in the river. A likely suspect is found: her ex-husband. Story knows he is a jerk, but a killer? Story must find out the truth before her bees and her business are just as dead. As someone who just went through Bee School this past spring, I was excited to be presented this book. You really don't find much about beekeeping in fiction. Join that with a new mystery series and I moved this fast to my to-be-read pile. 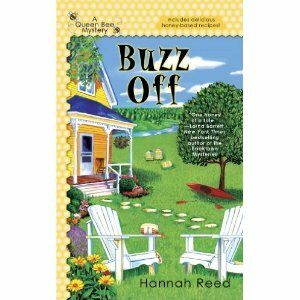 I think the basis for this new series is fun and a good storyline for a cozy mystery. However, there was a lot of details thrown at me in 312 pages. Story goes from celebrating her recent divorce to dealing with an old high school flame to trying to figure out if the police chief is mad at her for something that happened when they were teens. Those were just the possible romantic entanglements. The notion of "small town" sometimes gets lost in the large amount of characters in this book, and there seemed to be a large amount of characters with chips on their shoulders around Story. Then there were the lists. I make lists, I adore lists, but there were so many lists that Story made. Lists of people, of beekeeping facts, of gardening tips, of ideas about the murders. I think this premise would have worked better if there were not so many other details and people introduced in this book. Every character and plot device seemed to be thrown in: small town, philandering husband, divorce, new business venture, disapproving mother, old flame, angry police chief, assorted relatives, nosy neighbors (my list could go on). Plus having a sister who "text talks" - O. M. G. There was a lot of these people that tended to sidetrack the main plot of the murders without having a real place in them. The end of the book seemed to bring closure on some of these characters. Hopefully the next book in the series will slow down a bit and focus on a smaller group of people. The details about beekeeping, gardening and recipes are worthwhile to read if your interests swing that way. If you like your mysteries with a little bit of apiary love and a lot of small details, Buzz Off is a decent start to this series.